It seems that every week I have a pile of paper and card for recycling following a clear out. I’m always convinced this is the last lot but then another mound appears. Where does it come from? The Green Rooms are spacious enough for my needs but dint have that much storage space! Does paper breed in unopened drawers? Things really didn’t run smoothly today. My doctor’s appointment was interrupted 3 times by people who needed to access the cupboard in the room. Then I got on a bus to go to a meeting and arrived to find that I was the only one there. It then took about half an hour to get an internet connection and discover that I was in the wrong town. Even more embarrassing was that I’d booked the room! Then there was the fun of waiting and hoping that another bus would turn up that would get me to the meeting before the end. This did not occur. I was uninspired for dinner. So I fell back on pasta figuring I could add in Calvo Nero, onion, garlic, chick peas and a slug of the lemon olive oil that we (the royal we) bought back from Canada. It tasted a bit on the sweet side. I scrabbled for other ingredients to balance out the puzzling sweetness. Then I glanced at the label. It wasn’t oil. It was lemon balsamic vinegar. So the lessons are always read the label even if you think you know and there is probably something that can be done to make most situations more palatable (in my privileged first world existence). I felt perfectly dreadful on Saturday afternoon so I took to my bed. Clearly my body approved as it decided that I should remain there until the early hours of Sunday morning. As this point I woke up and was unable to get back to sleep (again). Even a spot of Dickens was unable to return me to the Land of Nod. So a bit after 5 (an improvement on 4) I gave up the fight. I made good use of my time cooking pearl barley, prepping and roast a butternut squash (flesh, skin and seeds) and making an oil free salad dressing (cashews, sesame seeds, lemon juice, dill, coriander and fresh mint). Then I had a shower, washed up and went back to bed where an hour later I was able to sleep again. It must the shorter days and the cold nights that make me want to hibernate. A visit to a friend, a slight misunderstanding over which parking spot, the note on the car and the horrible realisation that you’ve taken some else’s space. But when the owner of the space was so gracious about our mistake that it made me want to be more forgiving of transgressions too. It’s small stuff not worth sweating over. It is incompetence being attributed to malice. Last night was the first frost so I can stop saying, in a suitably menacing tone, “winter is coming.” Winter is here. I was chatting earlier in the week with chums about staying warm, wearing onesies and turning the heating in as late as possible. It reminded me of this article from the New York Times I read a few years back which considers how low to turn your thermostat (spoiler: a lot lower than you think)! Seth Godin blogs everyday and in yesterday’s post he suggested that we should all be dong it too. He suggested that giving it a go for at least 3 months would be pretty rewarding. So here is post 1. Let’s see how it goes. I call it chunky pesto but there likely is a word for it that means ‘salad ingredients chopped finely to be fancy’. Take fresh parsley, a garlic clove, a handful of almonds, salt, olive oil and nutrition yeast. Also required are bread of some kind and a nice ripe tomato. Chop the parsley, garlic and almonds. They need to be reasonably fine but no need to head for purée status. Unless you’re making a lot it’s probably not worth using a blender or food processor (and the end result will be less chunky). Put the chopped ingredients in a bowl and add a good pinch of salt, a slug of oil and a couple of health spoonfuls of nutritional yeast. Stir it all up until ingredients are well mixed. Taste test and add more of anything that seems necessary. Slice bread and tomatoes. Add pesto to rolls and top with sliced tomato. Put on a plate. Admire for 15 seconds and then tuck in. You know how it is; you get side tracked and then realise that it’s late, you still haven’t had dinner and you’re hungry! Add a good splash of oil to a frying pan. Get it really hot before you begin frying tofu slices (or they will stick). Don’t worry if the tofu breaks up a bit but keep frying until it’s a golden brown. 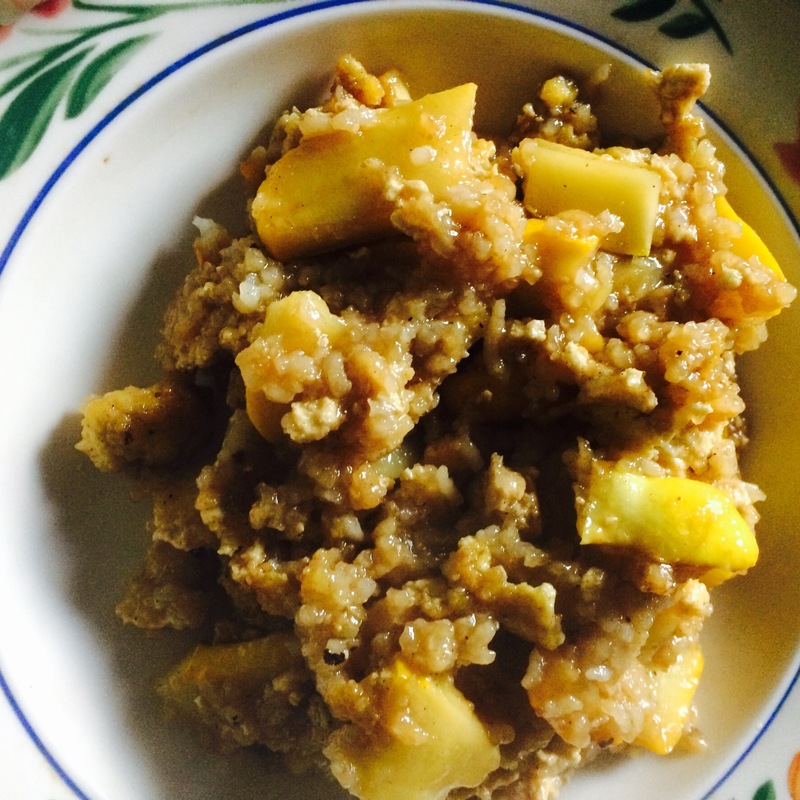 Chuck in chopped squash and ginger -I like plenty of chunky ginger but your mileage may vary. Once the squash is softening bung in the rice and give it all a good stir. Add a hefty splash of say sauce and mix it in. Cook util the rice is heated through. So turnip greens appeared in my veg bag this week. While not common in the UK apparently they are common in the rest of the world. 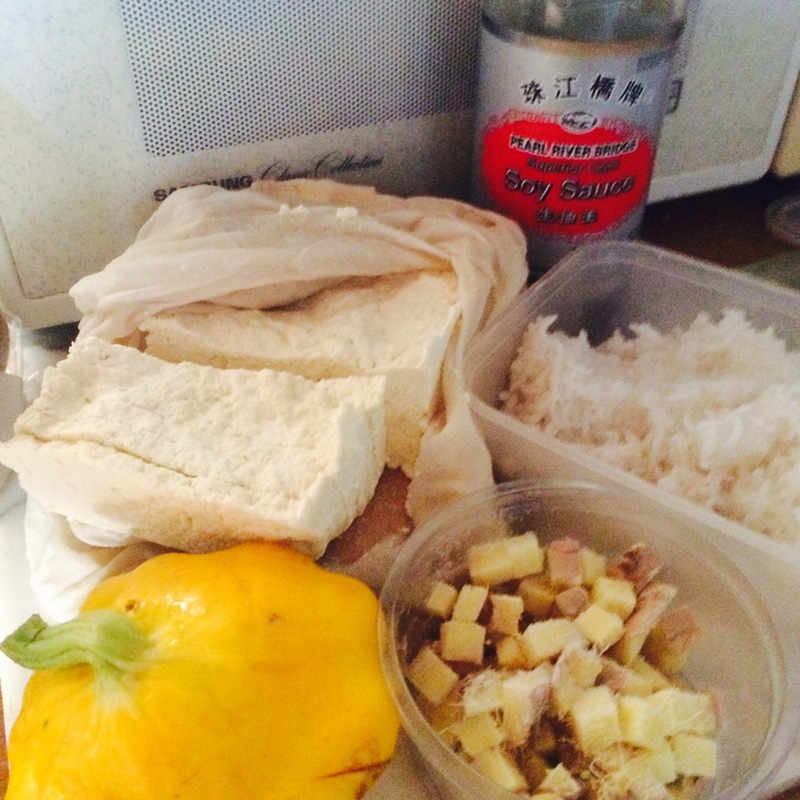 My searches for recipes showed them stir fried, steamed and lightly boiled. 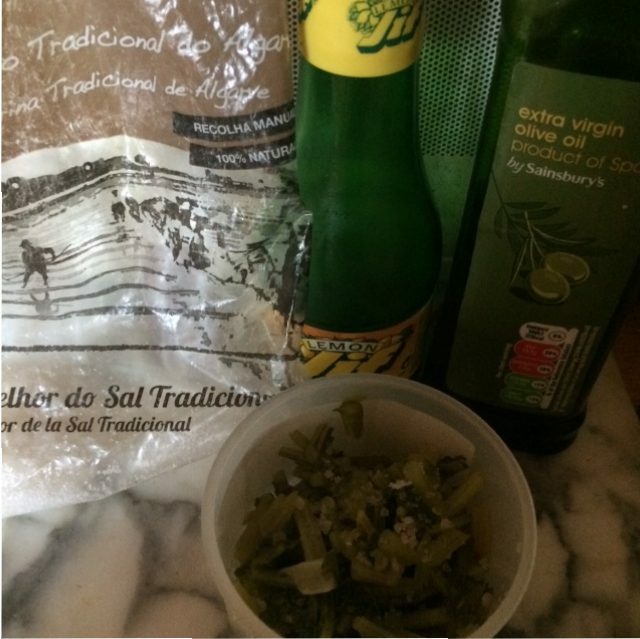 Olive oil is a popular pairing and they could substitute for kale, spinach or any green leaf. Yes, even raw although the taste is on the bitter side so maybe massage some of that oil in. 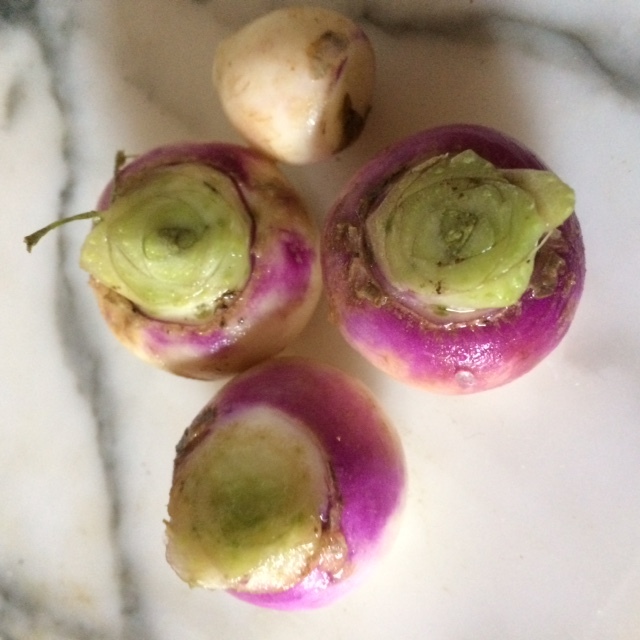 You can also cook the cute little turnips at the bottom of the stalk. Indeed according to the internet (obviously the fount of all reliable knowledge) this is popular in Japan with miso. 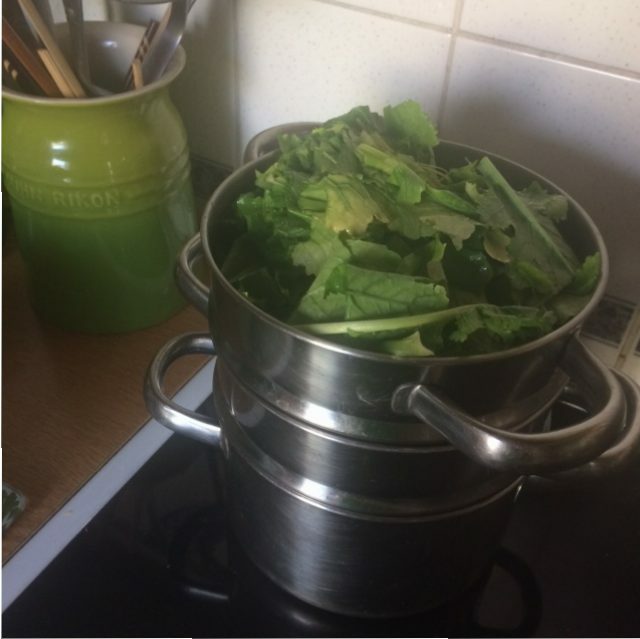 I decided to steam my turnip greens. Partly because I’ve been neglecting my steamer of late (beyond preparing potatoes for salad). But also because we’ve having a mini heatwave which makes it too hot to put on a frying pan. 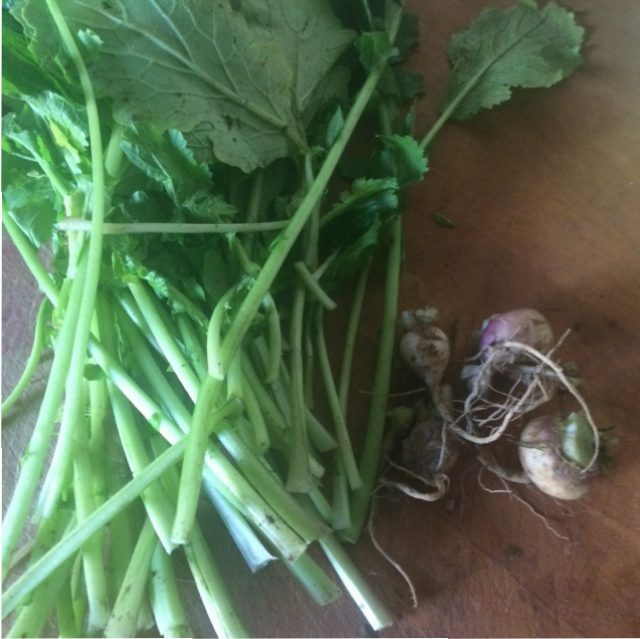 I started by chopping off the teeny turnips and picking through the leaves to remove any that looked a bit yellow. Clearly turnips greens are best eaten close to picking, not several days later. Actually this is a great rule for deciding what to eat first from a veg bag. Consume anything that is individual leaves or where the leaves are less than robust. 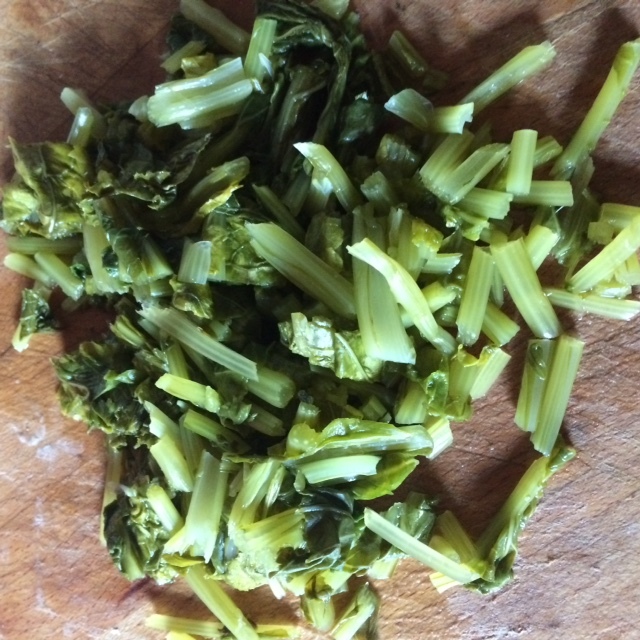 Spring greens can take few days in the fridge. Turnip greens not so much. Then I chopped the leaves into 2 inch pieces. I have a vague feeling that you are supposed to discard that stalks but as long as they are not too tough that seems wasteful. 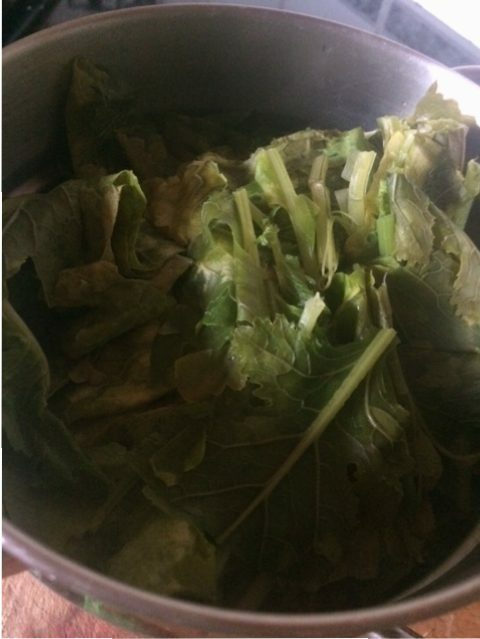 I crammed the chopped leaves into a steamer basket and left them to cook for 10 minutes. Once cooked further preparation was pretty easy. 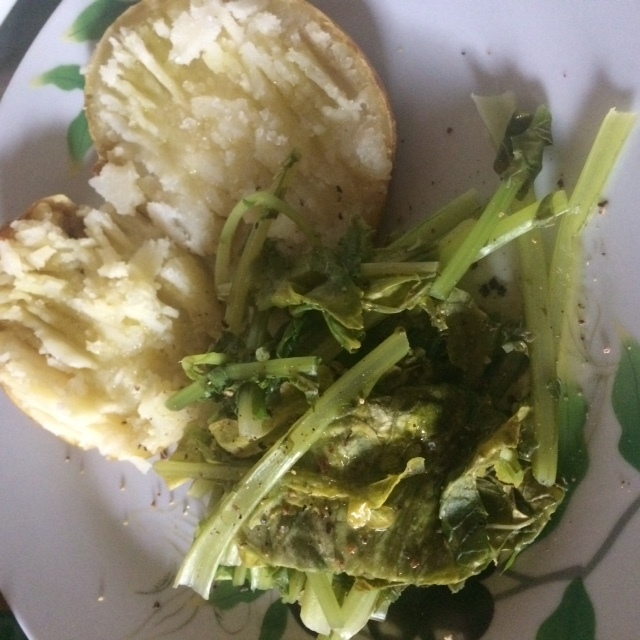 I spooned some onto a plate with a jacket potato and added chill salt and a splash of olive oil. A pretty easy, not to heavy dinner for a warm summer night. The remaining turnips greens I wanted to eat cold as they apparently do in Italy. So I popped the cooled turnip greens on a tub and added olive oil, lemon juice and salt. A bot of a shake and it was ready to go in my lunch box. 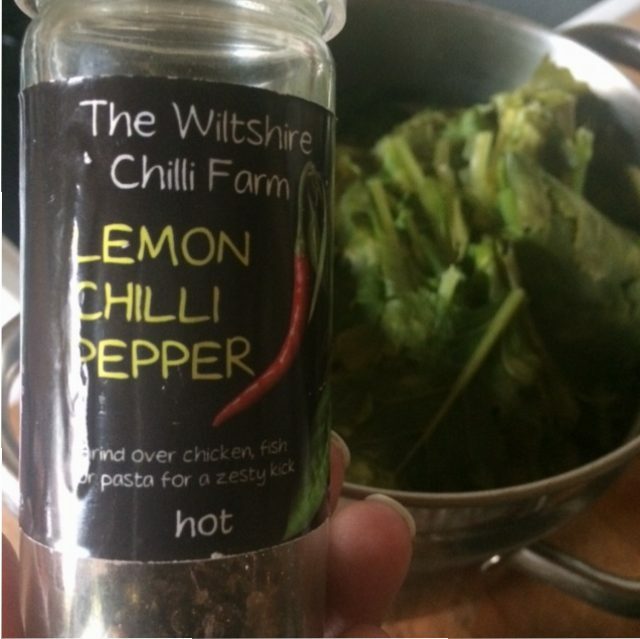 Yes I probably should have cooled the greens immediately after cooking but I think I got away with it this time! P.s. 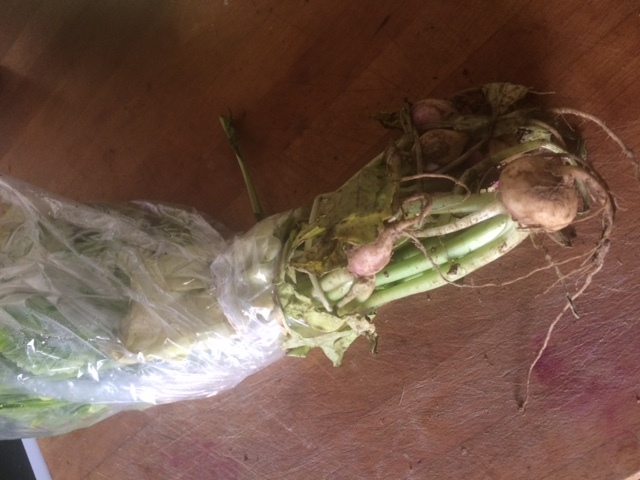 Aren’t the baby turnips adorable?